With its beautiful beach, award winning wining and dining scene and unique laid back atmosphere, Broadbeach on the Gold Coast is one of the most sought after holiday destinations in the whole of Australia. Our Broadbeach apartment accommodation at Aruba Beach Resort is perfectly situated to make sure you get the most out of it all. We are situated just 100 metres from the fully patrolled beach. Start your day with a refreshing paddle in the clear warm waters of the Pacific, challenge your friends to a game of cricket, throw a Frisbee around or simply wile away the morning lazing on the soft white sand. Come lunchtime, why not enjoy a picnic in one of the many park areas that line the coast close to our apartments Broadbeach Gold Coast. When it comes to days out the whole family can enjoy, guests at our Broadbeach resort accommodation are spoilt for choice. To learn more about Australia’s native wildlife, try a trip to Currumbin Wildlife sanctuary, just a short drive from our Broadbeach apartment accommodation. The 27 hectare sanctuary is home to hundreds of Australia’s native mammals, birds and reptiles, and is famously visited by a huge flock of wild lorikeets that drop by to be feed by visitors every day. 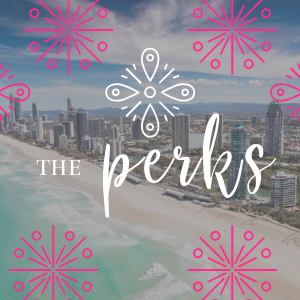 If you would rather test your nerve on a theme park ride than discover nature, venture into Surfers Paradise, just a few minutes north of our Broadbeach apartment accommodation and take your pick from a selection of thrill rides wide enough to satisfy any adrenalin junkie.